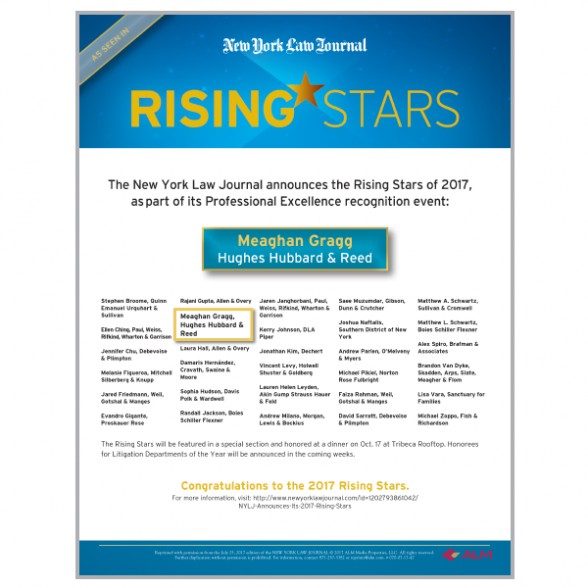 July 26, 2017 – Hughes Hubbard partner Meaghan Gragg has been named a 2017 "Rising Star" by the New York Law Journal. The annual list recognizes the region’s most promising lawyers under 40 and is chosen by a panel of distinguished judges. Rising Stars will be featured in a special section and honored at a dinner on October 17 at Tribeca Rooftop in Manhattan. Meaghan is a partner in the firm's New York office. Throughout her career, she has been featured prominently in significant and high-profile matters, including the representation of the Trustee for the broker-dealer liquidations of Lehman Brothers Inc. and MF Global Inc. She has been deeply involved in international arbitrations, cross-border disputes, and has made a tremendous impact at Hughes Hubbard through her pro bono work and substantial contributions to diversity initiatives. Hughes Hubbard is a New York City-based international law firm with a relentless focus on providing quality service to our clients and delivering successful results in the most complex matters. With a powerful combination of scale and agility, we offer clients innovative and effective solutions, while remaining flexible to adapt to their needs and market developments. Known for a collaborative culture, as well as our diversity and pro bono achievements, Hughes Hubbard has a distinguished history dating back more than a century.